Happy Tuesday! It’s a bleak and rainy day here in NYC, but I’m feeling warm cozy just thinking about this lentil and sweet potato loaf. 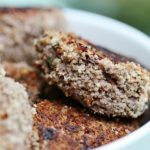 It’s my vegan spin on traditional meatloaf, and it’s so comforting and hearty. This is not the first lentil loaf I’ve ever made—it’s kind of a ubiquitous vegan dish—but it is the first lentil loaf I’ve been compelled to blog about, because so far it is the most successful. In the past, I’ve had a hard time getting the texture of the loaf just right, without using too many ingredients or having to go through a laborious number of steps. The texture of this loaf is spot-on, and it’s relatively easy to make, if more time consuming than some of my usual fare. Beyond that, it’s full of nutrition in the form of oats, lentils, and sweet potatoes. This is comfort food at its finest, and it is heavily satiating! A great recipe for when you need something that will stick to the proverbial ribs. Preheat your oven to 350F and lightly oil a loaf pan. Heat the oil over medium high heat in a large pot. Add the onions, celery and carrot. Cook, stirring frequently, until the onions are soft and clear, about 5-6 minutes. Add the garlic to the pot and cook, stirring constantly, for 2 more minutes. Add the thyme, rosemary, coriander, smoked paprika, salt, pepper, broth, lentils, and sweet potato to the pot. Bring the mixture to a boil and then reduce heat to low. Cover the pot and simmer until lentils are very tender, about 30 minutes. Remove the pot from heat. Stir the oats and tomato paste into the pot. The oats will absorb most of the remaining moisture in the lentil/sweet potatoes, and the mixture will become thick. Taste and adjust salt and pepper as needed. Press the mixture into a loaf pan. Brush with ketchup if desired. Cover with foil and bake at 350F for 20 minutes, then remove the foil. Bake for another 20 minutes, or until the loaf is firm and the ketchup is darkened in color. Allow the loaf to cool for 15 minutes before slicing and serving. Leftover loaf slices will keep in an airtight container in the fridge for up to 5 days. I hope you love this homey vegan recipe. Let me know what you think! This looks delicious! Does it matter what kind of lentils you use? Nope! 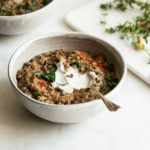 I think brown or green will be fine; if you use puy lentils, you may have a different texture. Ah lentils and sweet potatoes are possibly two of my favorite foods! The ingredient list looks relatively short so this looks pretty epic. Definitely will be making this ASAP as the rest of my family made a real meatloaf (ew) and maybe I can prove that this is much tastier! gena, lately i’ve been compelled to bookmark every recipe you’ve been posting. your palate is pretty much identical to mine and you’re cooking everything i want to eat right now. so insane and delish…cannot wait to make this loaf. also you just reminded me i miss YTTP 38th st, and a hot vinyasa class sounds de-lish right now. My new favorite studio in NYC. Hands down. Yum! That meal at Peacefood looks so great! As does your lentil loaf. I served my grandparents some spiced lentils with grated beets and carrots today, and it was also a hit! Can’t wait to check out the new page! Everyone in my family loves lentils and I’ve done tons of delicious meals with them, but never thought of making a lentil loaf before. It sounds very good! I can’t wait to try this recipe! 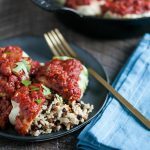 I’m always looking for meals that appeal to the non-vegans and I think this one will be a hit! It went over really well with my non-vegan friends. Great job on the lentil loaf…It looks wonderful. And awesome work on the FAQ page. I put mine up about 12 months ago but expanded it and covered the most common questions I get and fine tuned it to how I have it now about 6 mos ago and it has save me so.much.time with email replies to people….I can just send them the link, and it’s all right there. You just saved yourself tons of time and freed up many keystrokes. Congrats! 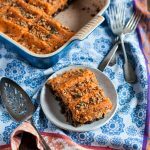 I love lentil loaf, but I never thought of adding sweet potato. It sounds delish! Gena, that looks so so so good, and I’ve been so recipe – lazy lately. I will be making this for dinner. I fall into the salad 3x daily trap when I’m busy too! But cooking just snaps me out of a funk and makes me so, so happy. oops, meant to reply to your previous comment! hah! I love Peacefoods. I wish they would open a downtown location! This loaf looks so easy and tasty! This is going onmy menu for next week! Baby will love it too! Yum!! loving all your recipe posts lately! i have so many holiday meals starred. glad youre enjoying being back in NYC. soak up the family time. i was so sorry to hear about your grandmother. we are in a similar situation with kyles grandfather right now, so i am sending you extra love. we need to catch up soon too bc i have no clue how things are going in your personal life. aside from school of course. which is all consuming i know. This sounds lovely! I was planning on making lentil salad for tonight’s dinner, but I think I’ll give this a go instead. When should the tomato paste be added? After adding the rolled oats? I’m wondering the same thing about the tomato paste – am planning to make this tonight for my parents! Also, do you think quick-cook oats would work ok? Or would the texture be too smooth? Yes! Have to fix that in the instructions. After oats, along with spices. If you don’t use oils, can the coconut oil be eliminated without sacrificing taste? If not, could use suggest a substitute? Just sautee the veggies in water. If it feels “dry” to you, you could add nut butter in place of oil along with the tomato paste and the spices.. I tried the soup and it was awesome ! Thanks. Just made this for supper and it was AMAZING. Thanks for the great recipe! gena new to your blog and loving it! quick questions! 1) can you grate a sweet potato in a food processor like a carrot? 2) do you know approx weight of sweet potato that would yield 1.5 cups? 1/2 lb? thanks! I’m sorry it didn’t work! I suspect soaking the lentils was a part of the problem, alas. Unfortunately it didn’t work for me, either, though I didn’t soak the lentils AND I added about 1/2 cup more oats because the mixture seemed a bit loose to me. I didn’t use any foil because it clearly needed to dry out more. The flavor was a smidge bland so I think next time I’ll add a little hot pepper… overall a really nice recipe that even my carnivore husband thought was close to excellent, but any other ideas for what I might have done wrong on the texture? I made this recipe last week and it was really good! Thanks for sharing. I’d like to make this tonight or tomorrow. Could I use quinoa instead of oats? Or do half and half? Thank you for a Gluten Free, Soy Free delicious vegetarian dish. It is Thanksgiving dinner this year!!! So did I! Glad you liked it. Hi! This looks really nice but I can’t eat oats. Is there anything I could use instead or could I leave them out? I really want to try this! Looks delicious! I would just like to know which kind of lentils you used. baking. absolutely d’lish! thanks gena! Looks delish! 🙂 Is that 1 cup of dry lentils or cooked lentils? In step 4 — I fixed the instructions. Thanks for catching. 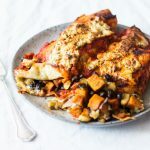 This is a really nice recipe, enjoyed by vegan and non-vegan members of the family alike for a Sunday family get-together meal. However, you wonderful recipe writers out there need to be aware of your international ‘audience’. To quote Wikipedia: “Today, most of the world prefers metric measurement by weight” as opposed to volume measurements. What should have been 15 minutes preparation turned into approaching 2 hours by the time we had converted into grams every single different substance. What a system! So, please can metric measurements be given as well. This should be part of your job as the recipe writer, not the cooks. Also where dry weight quantities are stipulated, as in the lentils, some cooks will be using prepared tins of pulses (very popular here in Europe). So, again something to think about in avoiding the need for further tricky conversion. Delicious. Made it for Rosh Hashana, for the vegans in the group (including me!). Have a couple of questions: can you tell me the approximate amount, in ounces or in cups of celery, onion and carrot you use in the recipe, as they vary so greatly in size. My loaf came out a little soft, even after letting it cool, before slicing. Thank you for this amazing recipe. Btw, All the non-vegans ate it and there wasn’t much left for me! I’m so happy that you enjoyed this for the new year! Typically when I make it it’s 1 cup of each vegetable, and I think that’s usually about 4-5 ounces of each, though next time I make this I’ll measure the weight. I hope this helps and that the loaf firmed up as it cooled! Made this for Christmas and even my meat-eating family loved it! It’s my second attempt at a lentil loaf and this definitely turned out better than the first. Texture is actually surprisingly similar to meatloaf (great for the meat lovers), and the taste is delicious. Will make it again! So delighted that you and your family enjoyed it, Heather!